After a busy week, the best way to spend a Friday night can be getting together with girlfriends. What could be more fun than to drink wine while enjoying some delicious food? Some might say that cooking is too stressful, or just too much work is involved, but with the proper planning and menu selection, having girlfriends over for a meal can be a perfect and simple evening. I have enjoyed cooking for my friends for many years, but in the past few months since Hurricane Harvey, I have been without a kitchen. One of the things I miss most is creating a delicious meal and enjoying it with friends in my home. Luckily for me, I have fabulous girlfriends who have invited me over to cook with them on Friday nights. They have even let me plan the meal on occasion. In planning a fun dinner (for your guests and for you as the hostess), I think that it is best to serve only one heated item. This ensures that you are not stressing over timing all the items to be ready at the same time. I have found that Chicken with Wild Rice from the Houston Junior League Cookbook is the perfect item to serve as a main course. I modify the recipe by substituting chicken breasts, sometimes boneless and skinless, and sometimes with bones and skin. Also, I use nonstick cooking spray on the casserole dish before I begin. The only advance preparation is the trip to the grocery store to buy ingredients, and the only dish used is the casserole dish – no mixing bowls or pots. Plus, you end up with both a hot main dish and a hot side that are ready at the same time. With the main course chosen, next I select a salad. Houston Junior League Cookbook’s Endive and Spinach Salad is one of my favorites. 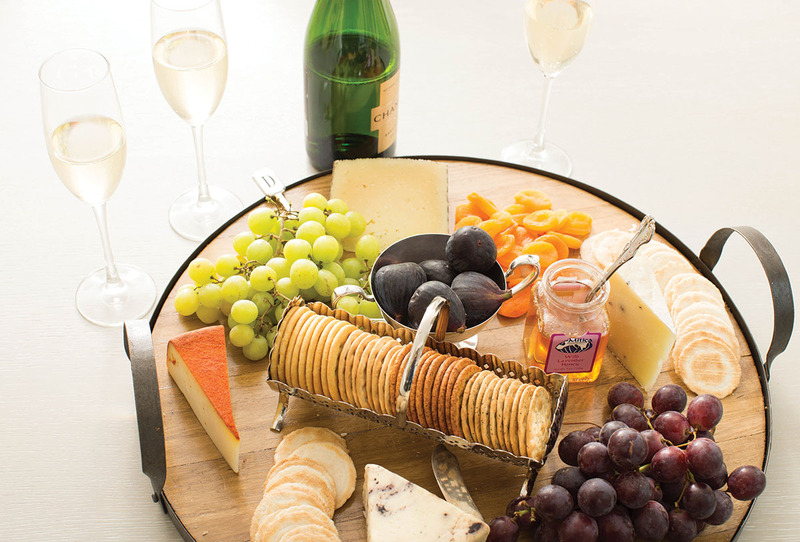 I will also select something to serve as my guests arrive: a cheese tray is perfect and can be made ahead of time. When creating a cheese board, Stop and Smell the Rosemary suggests offering guests at least three cheeses of contrasting color, taste and texture, serving around two ounces of cheese per person. Make sure to serve it unsliced and never cold; letting cheese come to room temperature releases its flavor. Complement the cheese tray with the Classic Bruschetta al Pomodoro from Peace Meals. Both the toasted bread and al pomodoro can be made ahead of time, allowing more time with friends rather than being trapped in the kitchen. And finally, Houston Junior League Cookbook’s Cut-out Sugar Cookies are one of my go-to desserts, as I love using cookie cutters to bring a theme to my dinner gatherings. Are your friends coming over to watch the Oscars? Well, statue and movie-reel cookies would be ideal. Are you watching basketball games during March Madness? Why not make some basketball and jersey cookies? Celebrating making it through the week? Heart- and star-shaped cookies are great, as they are a blank canvas for decorating. I find it is easiest to make the dough one day ahead and put in the refrigerator. While I am making the dough, I generally make the icing at the same time – a simple combination of powdered sugar, butter, a splash of milk, and either vanilla or almond extract. The next day, I roll the dough and make the cookies using themed cookie cutters. I apply flour to my rolling pin and do not use waxed paper. If I will be icing the cookies, I do not sprinkle with sugar prior to baking. With the cookie cutters I use, I generally get two to three dozen cookies, and they take about nine minutes per batch in the oven. It can be fun to have an activity after dinner, so I will often leave the cookie decorating for my guests. I put the icing in mugs and place the sprinkles on a Lazy Susan so that my friends can easily access all that they need to make the perfect cookies. Many a friend has found her inner-artist decorating cookies at my home. I also have plates so that they can take home the masterpieces that are not consumed. Note: you may want to make an extra batch of cookies – it is very difficult to consume just a few of these, and your friends’ families will be very happy for the cookies sent home to them. 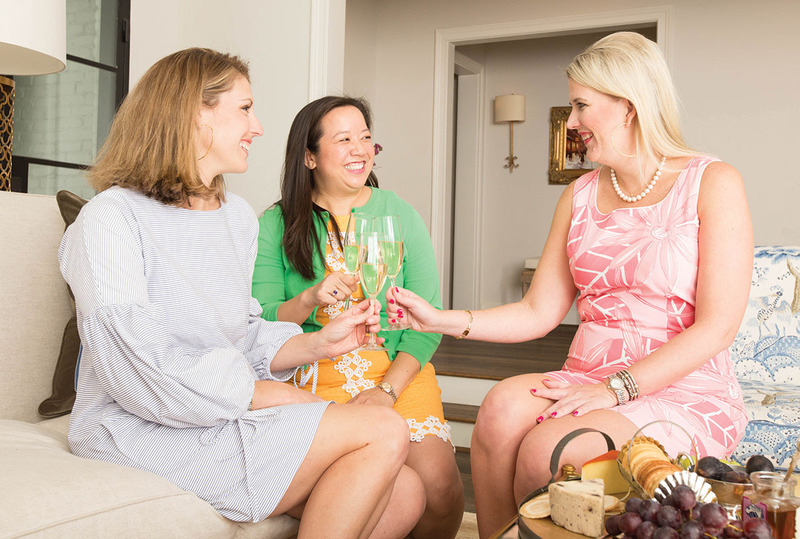 Having girlfriends over for dinner does not have to be an ordeal or an overly complicated affair. You can even rely on the same standard recipes. I find that simple can be best; your girlfriends will enjoy the meal and the company, and by keeping it simple, you, too, can have a pleasant evening. Editor’s note: To buy a Junior League of Houston cookbook, see jlh.org or call 713.871.6608.